For decades, the USS Constellation—a 150 year-old sloop-of-war with a proud record of service fighting slave ships during the Civil War—has bobbed placidly in Baltimore’s Inner Harbor, a banal tourist attraction surrounded by brightly-lit restaurants and colorful curio shops, the weight of its history largely forgotten. For one love-struck, ambitious, and just-this-side-of-crazy man, however, the ship’s aged timbers and obsolete cannons are a genuine inspiration, so he sets out to win his beloved’s heart… by breaking in, stealing the ship, and whisking her away on an impossible journey. Common sense says he’ll never succeed… but when a man has a vision, sometimes you have to believe. Productions: Active Cultures (DC, 2010); Towne Street Theatre (Los Angeles, 2010). Readings: Kennedy Center’s Page-to-Stage Festival (DC, 2011). 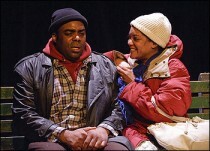 Recognition: Larry Neal Award (DC Commission on the Arts and Humanities, 2009). I’ve already said a great deal about this play here and here, but I thought I might share a few more words. I grew up in Baltimore, and I remain just as deeply in love with my city now as I was when I was young. American, multi-ethnic, historic, working-class, literary: the city has so many flavors it might as well be a smorgasbord, and I think I’ve tasted them all. For me, the soul of Baltimore has always been the U.S.S. Constellation, afloat in the Inner Harbor and carrying as ghostly cargo both the forward-looking ambitions and the ancient wounds of the city’s residents. It’s a ship of war, but it’s really a big poetic symbol, hovering at the edge of the city’s commerce with the water, both connecting us to the vast potential of the ocean and, because it does not (and cannot) sail, frustrating that connection as well. I honestly believe that the play I’ve written might not be my final word on the subject. There are unnumbered stories to be told about Baltimore, and I can imagine the ship as a looming presence in all of them, its shadow lending meaning to whatever transpires. If I were as big a visionary as August Wilson, I might even write a ten-play cycle… and perhaps, one day, I’ll consider myself up to that task.